The church of St Cuthbert’s is a Perpendicular Gothic church with a 15th century carved and painted angel ceiling. Its tower is typical of a group of local Somerset towers soaring vertically in one piece devoid of the usual stages of Gothic towers. The interior of St Cuthbert’s was designed to reflect the wealth of the merchants of Wells and to rival the nearby magnificent Cathedral of Wells. 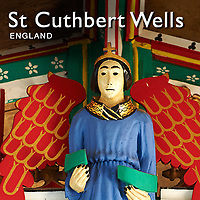 The roof is the showpiece of Wells with angels adorning its painted wooden ceiling. The angels are not put there to glorify God though. The heraldic shields the Angels hold glorify the merchants of Wells who had the money to pay for their immortality in the ceiling of St Cuthbert’s. In 1963 the then Vicar's wife, Mrs Barnett, organised the re painting of the naives wooden ceiling. The somewhat gaudy effect gives some idea of the impact that medieval churches in England would have had when all their interiors would have been painted.